Critically acclaimed former lead singer of The NowhereNauts drops Blues and Soul EP as her first solo effort and fourth commercial release. 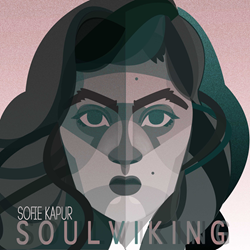 Soul Viking is Sofie Kapur's latest recording project in collaboration with a talented group of seasoned musicians delivering a fresh interpretation of classic blues and soul tracks. The EP showcases Kapur's uniquely powerful voice that has captivated critics and fans through the years. The record covers songs written by Joe Tex, Curtis Mayfield, Taj Mahal, and Kenneth Gamble / Leon Huff. As an active performing and recording artist in New York City since her early teens, she has received high praise for her vocal talents. “Sofie’s gorgeous, expressive singing is a revelation, combining a punk/new wave edginess and youthful vivaciousness with the command and confidence of a seasoned jazz vocalist” wrote The Big Takeover. WLURR FM Music Review proclaimed “Vocalist Sofie Kapur has one of the most soothing yet powerful voices that I have encountered”, and The New York Times Jon Caramanica called her a “kinetic lead singer”. Soul Viking is an independent release and Kapur's fourth commercial recording release. The EP was co-produced by Tom Rice and Sofie Kapur, engineered/mixed by V.D. King, and mastered by Roman Vail. Additional information can be found at http://www.sofiekapur.com. The EP is currently available for digital purchase on iTunes, Amazon and other major digital distribution partners. Physical CD’s will be available for purchase on August 5th.